The Monaco Yacht Show 2014 in the Principality of Monaco during twilight and a clear starry night sky and new moon. 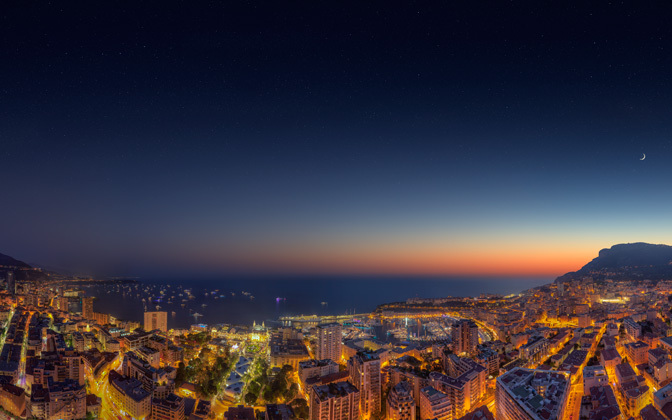 This photograph was taken after sunset from Monaco’s (now) second tallest building, Le Millefiori (at equal height with La Tour L'Annonciade), from the 37th floor. This photograph has a full resolution of 465 megapixel (27,297 x 17,060 pixels). For commercial use, please contact Crevisio. Canon EOS 5D Mark II, Canon EF 50mm f/1.2L USM. Photo Settings: 50mm, f/11, 8 seconds, ISO 100. Send a Private Message to the Artist of "Monaco Yacht Show Sunset 2014 Twilight"